During his first State of the State address, Nevada’s newly elected Gov. Steve Sisolak proposed several spending measures within a balanced budget that includes no new taxes. 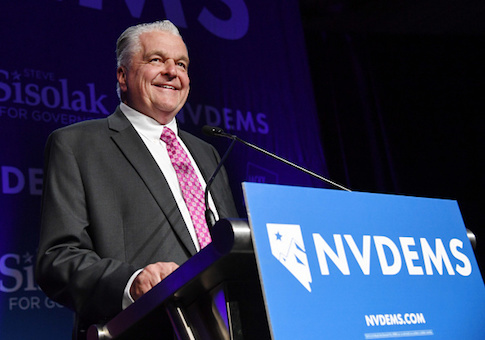 Sisolak emphasized Nevada’s growing economy, the need for continued job growth and full employment, expanding access to health care services, and pay raises for state employees, including teachers. He hopes with the expanded funding that "economic success makes it to every dinner table in Nevada." "While we have work to do, I’m proud to announce the state of the state is full of opportunity," Sisolak told state lawmakers. Sisolak began by listing the Silver State’s economic progress and its projected revenue gains. In 2020, the state was anticipating $4.3 billion in general fund revenue and in 2021, more than $4.5 billion. Last year was the first time the state invested the required 1 percent of general revenue funds into its Rainy Day Fund since legislation requiring it was introduced in 2011. Sisolak pledged to continue adding to the fund, stating it would bring an annual savings of $45 million over the next two years to grow the fund. Sisolak said his proposed balance budget includes no new taxes – yet even with economic-driven revenue increases it’s not apparent how his new spending proposals will be funded. For example, Sisolak said he was recommending a 3 percent pay raise for state employees, including teachers. He also emphasized his support for their right to collectively bargain, increasing the minimum wage, ensuring equal pay for equal work, and returning to the pre-2015 legislative era of offering a prevailing wage for public construction jobs. The Nevada Policy Research Institute said in a statement that Sisolak’s support of state workers’ rights to collectively bargain "will alone increase state spending by over half a billion annually, and will guarantee higher taxes next session." However, according to the latest jobs report, businesses are propelling the economy, Sisolak said, pointing to companies like Tesla, Google and those housed in Innovation Park in northern Nevada. Nevada’s job growth rate is one of the fastest in the nation, he said, with non-farm employment accounting for an additional 45,000 jobs last year. He introduced a new position to be housed within the Office of Lieutenant Governor, a "Small Business Advocate," which will focus on assisting more than 100,000 small businesses in the state. The advocate will help streamline regulatory processes and propose ways to reduce cumbersome and redundant regulations. Sisolak also introduced several boards and said he supported legislative proposals that will start this month. Next week, he plans to sign an executive order to create a Cannibus Compliance Board to help the industry grow "quickly and fairly." He also announced his support of a legislative committee proposal to offer $10 million in tax credits to companies that build or preserve affordable housing units. And he announced the creation of a new office in the state, the "Office for Nevada’s Newest Americans." It will assist illegal aliens, DACA and so-called "Dreamers," to better navigate and receive free taxpayer-funded public services. He announced that, in the coming weeks he would create a Patient Protection Commission, which would undergo a comprehensive evaluation of Nevada’s healthcare system. Sisolak listed several spending initiatives for educational programs ranging from K-12 through college level, including increased funding for graduate medical education, construction of two new college buildings, increases for Nevada scholarship programs, and the first pay raise in 12 years for state teachers. Despite his pledge of "no new taxes," Sisolak said he plans to review the state’s tax policies to ensure that tax dollars follow the student and that "statewide funding is equitable for every student in every county." In addition to increasing funding for several educational programs, Sisolak pledged to hire more police officers and social and behavioral health workers at public schools, directing a portion of the 10 percent marijuana tax to be allocated toward school safety. To ensure "school safety," Sisolak wants to implement "common sense" background checks on all firearm sales in Nevada, yet he did not outline what they would entail. He pledged to outlaw bump stocks, and prevent domestic violence abusers from being able to purchase a firearm. He said those subject to restraining orders should not be allowed to buy a firearm. During the runup to the midterm election, Sisolak’s campaign refused to respond to domestic violence allegations the Daily Caller News Foundation (DCNF) detailed in an interview with his ex-wife, Lori Ann ‘Dallas’ Garland, and four individuals who corroborated her story. Garland gave photos of her bruised neck to the DCNF, which published them along with a diary entry detailing the alleged incident. It remains unconfirmed if Sisolak has ever had a restraining order placed against him amidst alleged domestic violence altercations, or if he owns firearms. Like other newly elected Democratic governors, Sisolak pledged to combat climate change and create jobs by moving the state to become reliant on at least 50 percent renewable energy by 2030. He closed by calling on the Legislature to support the largest investment of general fund dollars to health care in Nevada state history. This includes funding for ongoing Medicaid expansion, increasing Medicaid reimbursement for neonatal units, reducing wait-lists for children with autism, increasing access to mental health services, and increasing hours of mobile crisis units and community health services that help patients with substance abuse, among other initiatives.